If you’re anything like me, you probably pushed that play button a few times. I didn’t want to miss a moment of it. Seeing Michael Shannon as Zod for the first time? Diane Lane and Kevin Costner as Martha and Johnathan Kent trying to explain to their adopted son that he has to hide his incredible gifts? Finally seeing Lois Lane (Amy Adams)? And in probably the coolest moment, seeing Henry Cavill as Superman taking flight? It’s all incredible, which makes it a whole lot harder to wait for June 14th, 2013. I don’t know how you Superman purists feel about it, but this is one origin story I want to see on the big screen. But we do have to admit that this movie is going to be vastly different than any of the other superhero tales. This big part is the identity crisis that Superman seems to be having. His human father, Johnathan Kent, seems to think that telling the world that Clark Kent has these powers is incredibly dangerous. I suppose that’s why the marketing has been showing a Superman in chains, as opposed to one beating the crap out of bad guys. While I’m sure the film will include the awesome action sequences we’re all craving (check out Henry Cavill on fire at 1:49), the fact that it will have a heart is equally exciting. This is a story worth telling right because it might be around for a long time to come. There’s not any confirmation yet on whether this movie will tie in with the planned Justice League film that is scheduled for 2015. But if this ends up being a sneak peak for things to come for DC, then I think they’re taking a step in the right direction to be different from Marvel. The Avengers might be full of comic book fun but it looks like Superman and Batman might be made of deeper stuff. We can only wait and see how this turns out. But for now, hit that play button on the trailer again and enjoy the ride. 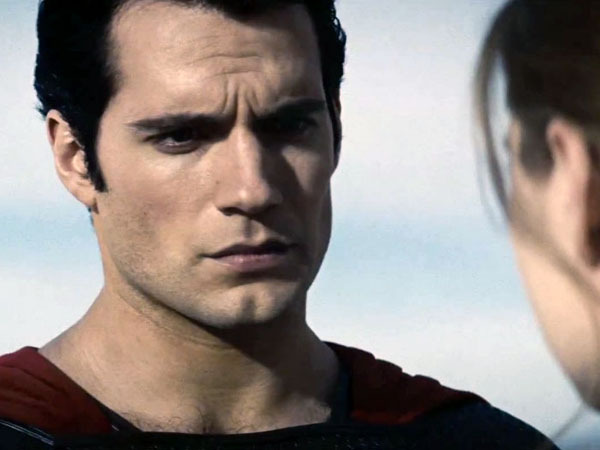 What do you think about the new Man of Steel trailer? Are you excited about this upcoming version of Superman or do you prefer the old one? Comment below!